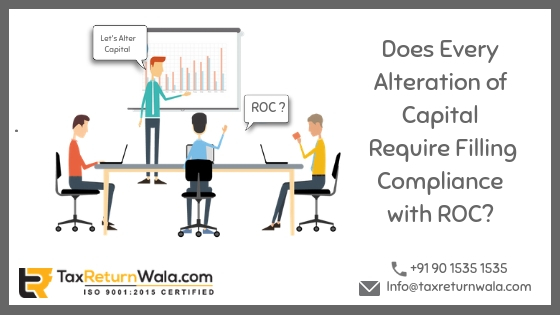 Does Every Alteration of Capital Require Filling Compliance with ROC? To register a new company, it is mandatory for all that all compliances get filed and authenticated by an authorized ROC (Registrar of Companies) appointed by government. He after all verifications grants his consent for major compliances of companies. Not only in registration of new companies but ROC also has a definite role to play while confining to major company compliances like registration of company trademark, making an amendment in AOA/MOA, addition or removal of directors etc. Regulates reports, working of shareholders & directors and annual filing of documents. ROC provides the certificate of commencement and incorporation for a business which gives actual working environment to the company. ROC as per Companies Act also work as audit person of the company which can anytime ask for any supplementary information from the company or can seize its books of accounts with prior approval of court. ROC is required to file a petition for final closure of business. Conversion of fully paid up shares to stock. -> Role of ROC: Notice post to makeing a change in share capital includes submission of notice to registrar within 30 days. ROC can impose a prescribed fine or penalty if such provision is not considered carefully. Cancellation of paid up capital which is lost or unpresented against assets. Paying off paid up capital no more required in company. By any other method approved by court. ->Role of ROC: After getting the order of capital reduction passed by court, it is further passed on to ROC along with minutes of general meeting of related decision for final conclusion. ROC then certifies the application of reduction by not considering whether the said clause is present in AOA/MOA or not. ->Role of ROC: The application for transfer of capital to reserve status requires prior approval and certification of ROC. ROC grants for approval for creation of reserve capital based on minutes made in general meeting, the resolution passed and the court order. Checking Variations of Rights of Shareholders: A company issues various classes of shares and also provide varied rights to each shareholder. If a company wants to share rights/duties/responsibility status of shareholders it has to take prior approval of ROC. ->Role of ROC: The written consent of about ¾th of the total share class holders is required to get court approval for change in role of shareholders. On receipt of consent it is to be submitted to Registrar within 30 days for certification .Any default made in such provision might impose big fine and penalties. Reorganization of Capital: Reorganization of share capital can be done in a way by either consolidation or division of shares in to new classes. Reorganization can be done between (i) Member and company (ii) Company and its creditors etc. ->Role of ROC: On receipt of court order ROC grants approval to reorganize capital structure. Thus, ROC has an inevitable role to play in all company compliances whether it is incorporation, changing role of directors, alteration in MOA/AOA or whether it is alteration of complete capital structure.